Most people associate piston rings with vehicles in particular. There are, however, many other areas of applicability and that is the Rottink field of specialisation. Shipping, chemicals, aviation, power generation and many other branches of industry. Everywhere, in fact, where strict, precise requirements are set on piston rings and metallic seals. But not the gigantic quantities, just the smaller, refined piston rings. Usually manufactured in small series preceded by precise development and prototyping. Piston rings can be found in several applications. They ensure a seal, lubrication and heat conductivity between the cylinder and the cylinder wall. Piston rings determine to a great extent the optimum performance of engines, pumps, compressors and similar devices. This means with a minimum of standstill and with the lowest possible maintenance costs. 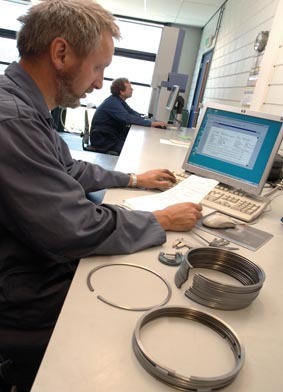 Piston rings are therefore vital for the continuity and the returns of business processes.